Hindi and Korean tele-dramas have invaded local tele-drama sector in Sri Lanka due to bringing down cheap tele creations and artistes in the country have been reduced to the level of wage slaves says JVP Parliamentarian Dr. Nalinda Jayatissa. The Parliamentarian said this participating in a discussion on issues in the aesthetics sector organized by Verité Research Institution. Tele-dramas have cast away objectives of aesthetics and have become a sector, an industry that targets profits only and as a result of being paid the minimum for creations skilled artistes have been made to leave the sector which has adversely effected the sector said Dr. Jaayatissa. The mass media makes the first income by buying substandard foreign creations and the trader who is promoted to sell the Indian saree, the slipper, the necklace and the bangle makes the second income elevating the invasive tele plague to the top said tele-drama Director Anurudha Jayasinghe participating at the discussion. The Senior Lecturer at the Faculty of Aesthetics of Peradeniya University Athula Samarakone and the Secretary of Tele-drama creators Society Suresh Abeysekera also participated. 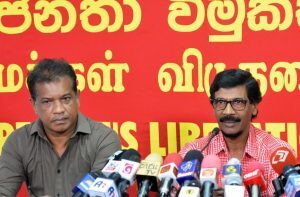 The JVP demand the government to take legal action against the governor of Central Bank and others who were involved in the Central Bank bond scam and to recover the money defrauded by the scammers. 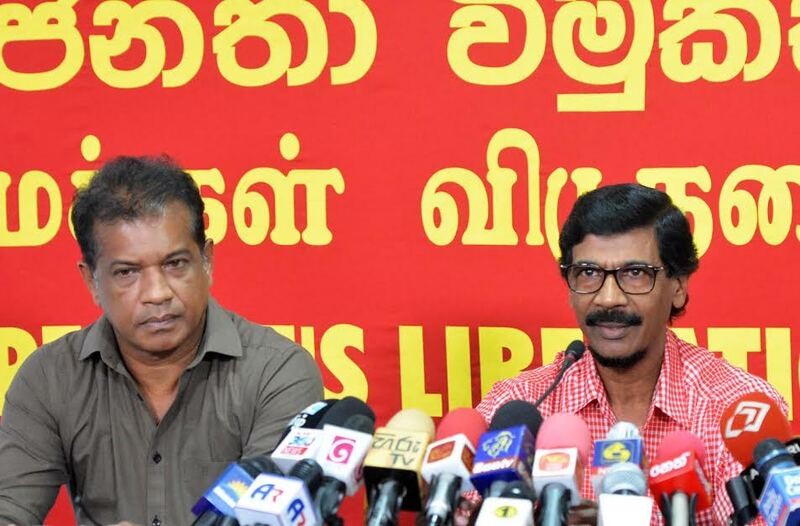 The General Secretary of the JVP Tilvin Silva held the press conference at the head office of the JVP at Pelawatta today (9th) to present a set of proposals to be implemented immediately to take action regarding the COPE report. The Member of the Political Bureau of the JVP K.D. Lal Kantha too was present. Mr. Tilvin Silva said, “The government, instead of taking action on the released COPE report, is making various statements. The ministers of the government too say at various places that fraudsters should be arrested. Former President too is making a big fuss. They attempt to make use of the bond scam a cover to conceal their frauds and make the people forget charges against them. Ministers such as Ajith P. Perera and Dilan Perera say bond thieves must be caught. When ministers talk in such a way we have a doubt as to whose government is this. What they are really doing is attempting to deceive masses instead of taking legal action against the Central Bank bond scam. It is like the trick of thief crying ‘stop thief’. The people don’t see a thief. This is really insanity. Hence the JVP decided to pressurize the government in connection with the immediate action that should be taken on Central Bank bond scam. A mandate was received on 8th January, 2015 to end the corrupt Rajapaksa family rule. The people wanted legal action to be taken against fraudsters and the corrupt. However, by 27th February a large scale fraud was committed inside the government. It is an incident related to issuing Central Bank bonds. It was the Leader of our party Comrade Anura Dissanayaka who held a press conference and exposed this scam to the country first. We proposed to remove Arjun Mahendran, the Governor of Central Bank and hold an inquiry about the scam. However, the government did not take any action. Meanwhile the JVP gets the chairmanship of the Committee on Public Enterprises (COPE). COPE takes over the investigations. It was not handed over by anyone. The government did not give the needed assistance for the investigation. Meanwhile, there was an attempt to threaten officials regarding an exposure of a secret report from the Central Bank. However, COPE investigations continued without any hitch. Later, when the report was being compiled UNP Parliamentarians in COPE were deployed to weaken the report. On one instance Comrade Sunil Handunneththi walked away from a meeting under these circumstances. The viewpoint created by this incident was disadvantageous to the UNP. Then the UNP changed its strategy. They attempted to include words that give a political twist to recommendations in the report, include recommendations that went beyond the purview of COPE to get the report rejected in Courts. However, they failed in all their attempts. As a result they are furious and are making a din in the society. The Prime Minister is massively responsible for the scam. It was he who took over the Central Bank which all this time was under the Ministry of Finance. He appointed Singapore citizen and his good friend Arjun Mahendran as the Governor of the Central Bank. As soon as Mahendran was appointed governor he got involved in the bond scam on 27th February. This created uproar in the society. If the Prime Minister was clean he could have removed the governor and held an inquiry. However, he did not carry out any such action. He went on to protect the governor. He attempted to reappoint Arjun Mahendran when his term came to an end. However, due to the public opinion the attempt to reappoint him failed. When COPE inquiry was continuing Parliamentarian Velukumar, who was a UNP member of COPE, was removed and Sujeewa Senasinghe was appointed. He and other UNP members in COPE were instructed to carry out an exercise to manipulate the report according to the need of the UNP. However, all these attempts were defeated and a strong COPE report has been presented to the country. In such a situation the government must take measures to immediately implement recommendations in the COPE report. The JVP proposes the following for such an exercise. What the government should do now is not to shout on the streets regarding the bond incident but to take legal action. Also, these immediate proposals should be implemented. We have no trust in the conduct of this government. As such, a public opinion should be built up and pressurize the government to take action. We call upon the people in this country to rally with us. Donald Trump claimed victory in the presidential election today (9th), delivering a speech at the Hilton Hotel in New York City to a cheering crowd of supporters. Trump received 276 electoral seats against the 218 electoral seats received by Democratic Party candidate Hillary Clinton. It was an unexpected outcome for the Republican candidate, who beat out not only a stacked GOP primary field but also an even more formidable opponent in Hillary Clinton, who was consistently ahead of him in the polls up and in a much stronger position on the electoral map. Trump, the Republican nominee has achieved one of the most improbable political victories in modern US history, despite a series of controversies that would easily have destroyed other candidacies, extreme policies that have drawn criticism from both sides of the aisle, a record of racist and sexist behaviour, and a lack of conventional political experience. Republican candidate Donald Trump has scored a series of shocking wins in battleground states including Florida and Ohio, opening a path to the White House for the political outsider and rattling world markets counting on a win by Democrat Hillary Clinton. Mr Trump surged to wins in Ohio, Florida, Iowa and North Carolina. However, Mr Trump is leading Mrs Clinton by 19 Electoral College votes, according to media reports that put him on 244 votes and Mrs Clinton on 209. Mrs Clinton still has ways to reach 270 electoral votes but she will have to sweep the remaining battleground states including Pennsylvania, Michigan and Nevada. Forty-one states have been called so far. Mrs Clinton has won 17 states to Mr Trump’s 24. There are 538 Electoral College votes allotted to the 50 states and the District of Columbia. It takes 270 votes to win.